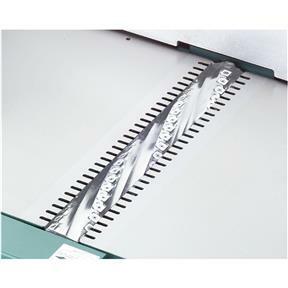 For the ultimate in extreme-duty machines, the G9860ZX features a 6 spiral, indexable insert cutterhead. By using a "spiral" cutterhead, the knife never leaves the wood like a conventional jointer. This provides the finest finish available & a much quieter machine that's unlike any other. The carbide "inserts" are not only replaceable, but each one has four cutting edges & can be turned 90° to expose a new cutting edge. It's like getting four blade changes for the price of one! Approximate shipping weight: 1241 lbs. 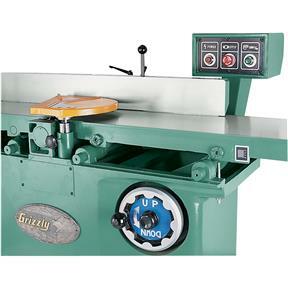 I bought this machine a few weeks ago as an upgrade to the 8 jointer I bought from Grizzly eight years ago . There is nothing wrong with my old machine and I will be keeping it as a backup should the need ever arise. The new machine arrived on time and without any damage. After getting it setup in the shop I discovered that the guard over the cutterhead wouid only open halfway. After a short conversation with Grizzlys technicians a new guard assembly was on the way. My wife and I run a mom and pop cabinet shop that is filled with Grizzly equipment. And we wouldnt have it any other way. I've had this machine for a few months now and I love it. However, the reason I gave it four stars is because there are a few things I didn't/don't like. I'll start off with those. 1. Like many others on here, I have issues with Grizzly's shipping choices. Solution: contract out a shipping Co that has powered hand trucks or fork lifts so they can facilitate the moving and placement of these expensive machines. I paid nearly 10k for two machines and a dust collector and had to go pick the machines up from the freight hub when they got close because they were going to drop 3,000 lbs worth of machines out in the street. Thats a non-starter. 2. 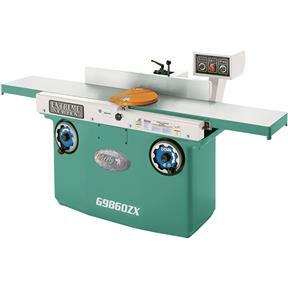 I feel that the G9860ZX 12" jointer I purchased is a bit underpowered. I learned pretty quickly that if you're jointing anything over 6 inches, you can't take more than about 1/32" inch or it'll bog down and shut off...right in the middle of a jointing operation. Maybe thats common among jointers of it's size, but I don't like it. Especially when said jointer is nearly $6k. I guess the logical solution is more power; a 5 hp instead of 3 hp motor would probably be ideal. 3. My shop floor isn't level, so I had to add leveling feet to the machine. The leveling feet slots, in my opinion, are not very well thought out or engineered. 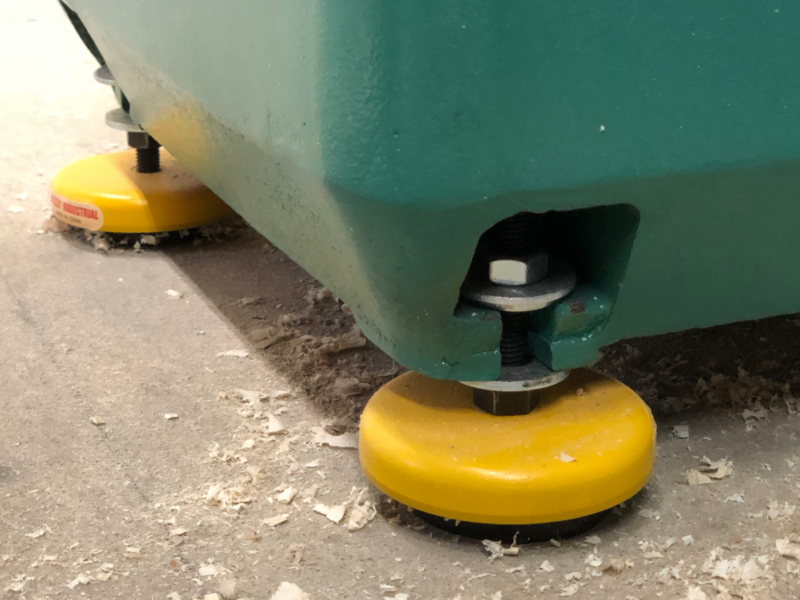 When I was first looking at putting the feet on, I wondered to myself for quite awhile how they were supposed to safely and effectively attach to the machine. For one, the slots on the machine are not all machined out to the same dimensions, one was slightly smaller than the others. This matters because the stems to the feet are quite long and they JUST fit in the slots. 4. The fence system. There's nothing wrong with a fence on a dovetail type mount, but when the fence is as heavy and cumbersome as said jointer's fence, and for a jointer thats up near the $6k range of jointers, the fence should be mounted with a rack and pinion system that's adjusted with a hand wheel, period. 5. The power cord. The cord from the jointer was maybe two feet long and I had about four feet to my outlet. I had to go out, buy a length of cord, and extend it from the machine. As far as complaints go, I think that's about all I have. Now for what I do like. 1. The machine required very little adjustment out of the crate. I adjusted the tables slightly and it was good to go. 2. After I figured out what it's limitations are, it joints very nicely and creates an almost glass-like surface. 3. Once the tables and fence were set up and aligned properly, it joints an accurate 90 degree edge, which is what we want in the first place, right? 4. It's extremely heavy and is nearly vibration free. 5. Dust collection is adequate and what you'd expect it to be with a 3hp canister dust collector that's no more than fifteen feet from the machine. 6. The hand wheels for the bed adjustment operate very smoothly and effortlessly. 7. The finish of the machine is nice and has minimal defects. 8. Noise. I wear ear pro anyway, however, the machine is very quiet when running. 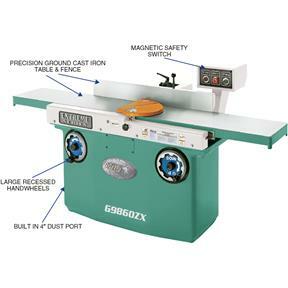 I think my 6" bench top jointer is noisier. Overall, this is a nice machine. It does what its supposed to do. I do, however, think they could make it a bit better at it's price point. Anyway, hope this review is helpful. 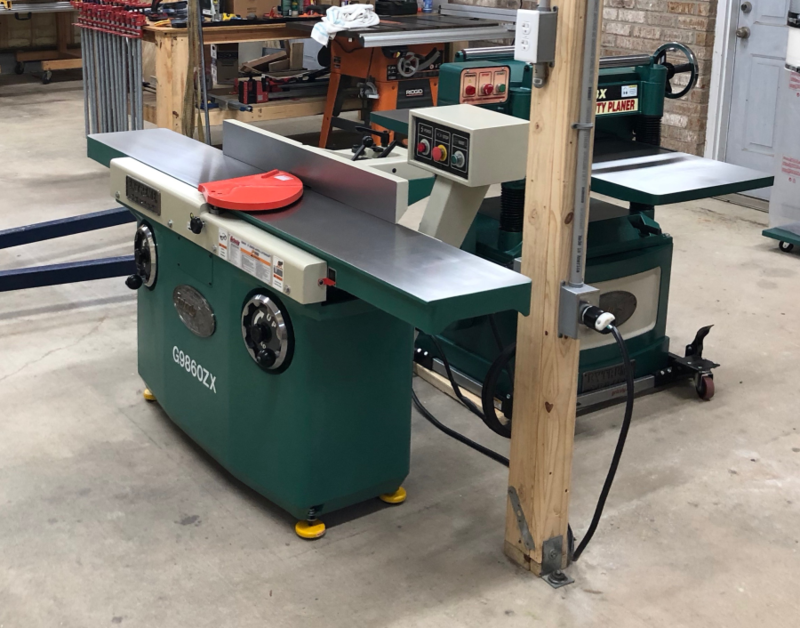 I've had this jointer for over a couple of months now and it's a great machine. Flat, true, and quiet... all you'd expect for a machine of this size. Tearout on boards is very, very minimal or all together non existent. Great machine thanks Grizzly!